The Findhorn Village Conservation Company (TFVCC) can confirm that on 28 February 2019 it erected temporary fencing between the boundary of the land it owns, and adjacent land owned by Calren Limited, who operate the Findhorn Sands Caravan Park. This follows the development of chalets by Calren Limited, which has encroached on to land owned by TFVCC, next to the southern boundary of the Findhorn Sands Caravan Park. Caravans have also been sited on land owned by TFVCC, next to the northern boundary of the Findhorn Sands Caravan Park. TFVCC has made numerous attempts over many months to resolve this issue by mutual agreement to the benefit of both parties. However, the directors of Calren Limited, have rejected repeated requests to meet. As a result, TFVCC has been left with no alternative but to fence the boundary of the land it owns, to prevent any further encroachment. The fencing crosses the gardens of some chalet owners on the south boundary of the caravan park and will restrict access to some caravans on the northern boundary. TFVCC regrets having to take this step and apologies to chalet and caravan owners for the inconvenience, but its prime concern is to protect the land owned on behalf of the community. The land owned by TFVCC is part of 800-hectres of residual land holdings, previously owned by Novar Estates and bought by TFVCC in a community buyout with help from the Scottish Land Fund in March 2016. The boundaries are clearly marked on title deeds lodged with the Scottish Land Registry. TFVCC remains willing to resolve the matter with Calren Limited through negotiation. The land owned by TFVCC is managed by volunteers for the benefit of the community and not for private profit. It is the hope of the TFVCC directors that this issue can be settled without legal recourse. Notes to Editors:TFVCC (The Findhorn Village Conservation Company) is a community led and controlled company limited by guarantee with charitable status. We were set up in 2011 and our membership is open to anyone on the electoral roll living in the postcodes of Findhorn village. development and conservation of the natural environment. Following feedback from users of the Beach Car Park, TFVCC are offering the opportunity for users to pay an annual donation of £15 for car parking at the Beach Car Park. 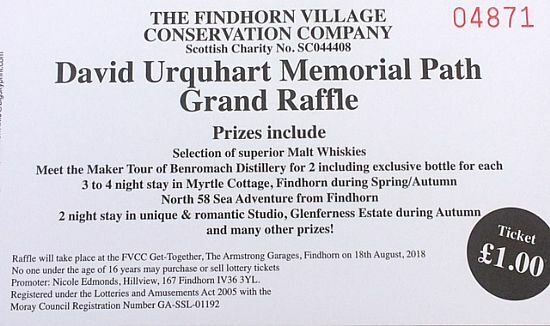 To apply, please email findhornvcc@gmail.com with your name, address, vehicle registration(s). Payment can be made by cash/cheque/BACS initially. Prize draw to be held at the Armstrong Garage Celebration on Saturday 18th August. Click here for the TFVCC AGM Chairman's presentation. Click here for the TFVCC Traffic & Parking Consultation presentation. Full findings of the consultation to follow at a later date. PARKING FEES - NORTH SHORE. A parking fee system for cars and campervans has been introduced at the North Shore parking area. This was included in the original business plan when TFVCC acquired the land around the village and is part of the strategy to be able to continue to run this charity with balanced incomes and outgoings. Unfortunately, managing this land does incur necessary running costs and it is essential that we gain sufficient income to cover this. TFVCC runs with no profit. All money collected will be used entirely to cover the necessary costs of sustaining and improving the area for all to enjoy. The system is based on the use of an honesty box, which is emptied daily. The Company has appointed David Maclean, a creative freelance Development Project Officer, with specific responsibility for the newly aquired land and garages in Findhorn village. David will be working at the Findhorn Village Centre every Tuesday. Please feel free to come and say hello and discuss any issues or suggestions you may have with him. Exciting News: Garage site purchase successfully concluded! The Company is excited to announce that the purchase of the garage site was finalised on 9th January 2018. Very early days but, after a quick tidy up, these garages and parking spaces on the site will be available to let. The letting policy and application forms are available via the "Garages" page of this site. Please get applications in by Sunday 11th February for allocation of the first group of garages, which will be available for occupation soon. The allocation (and draw from a hat if over subscribed) of places will take place on Wednesday 14 th February. Hopefully this will meet the demand of local people who wish to use these facilities whilst raising necessary income to pay back the loan the Company took to close the gap from the grant funding as well as providing funds for further improvements. Donations or loans would also still be welcomed to help pay back the loan - please click here to download form. Final Accounts to March 2017 published - see link from Minutes page. 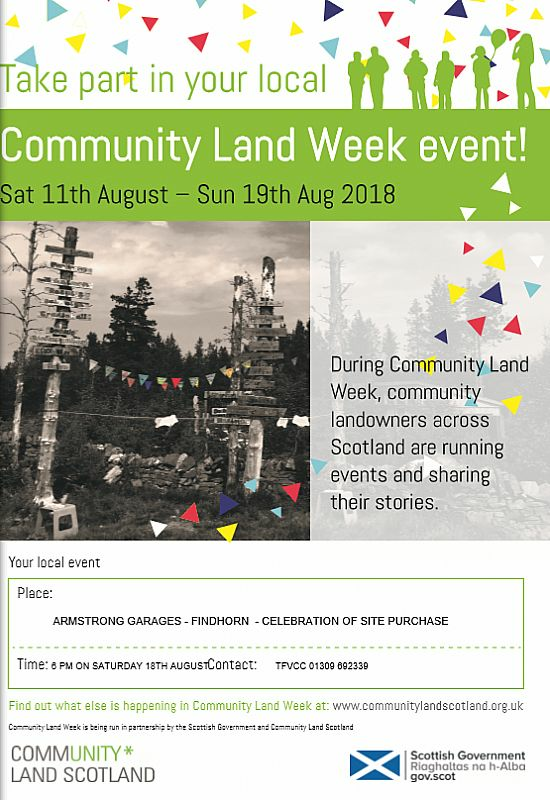 The Company is excited to announce that it has reached another major milestone by securing grant funding of £180,500, from the Scottish Land Fund, which would contribute £161,500 towards the purchase the Garage site in the centre of Findhorn which has historically been used for storing boats and contains buildings previously used as workshops and garages. The Company has registered a community right to buy on this site which has been owned by the same family since 1929. Continuing to have ownership of this land by the people of Findhorn would be an excellent strategic fit for the future development of the village, as it is centrally located and would offer options to bring new vibrancy and life into the village itself. In addition to the extra facilities that this could provide, it would generate rental income – an essential ingredient to provide a stable platform for the Company’s, and Findhorn’s, further development aims. TFVCC (The Findhorn Village Conservation Company) is a community led and controlled company limited by guarantee with charitable status. We were set up in 2011 and our membership is open to anyone on the electoral roll living in the postcodes of Findhorn village. Across Scotland, land is being bought by communities who wish to remove the uncertainty inherent in private ownership. Land ownership by the community will unlock tangible assets, but it is the intangible skill and determination of people that will see opportunities and accomplish projects - for Findhorn village we will need both. With strong community backing we applied to the Scottish Land fund and have been successful in our bid to buy the residual Novar Estates land in Findhorn. Currently our solicitors are in the process of finalising the conveyancing, which will be completed by the end of March 2016. "Good place-making can provide communities with an important cultural context; a sense of pride and belonging; and a sense of local and national identity. It can provide environments which function well; link well with surrounding settlements and provide attractive areas in which to socialise, to move around and to do business." Our vision is the sustainable stewardship of the natural and built environment of Findhorn.